Jojo is prepping for an exciting night; it’s time for the bat count! 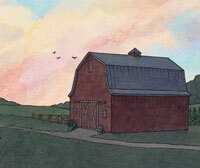 Bats have always been a welcome presence during the summers in the family barn. But over the years, the numbers have dwindled as many bats in the area caught white-nose syndrome. Jojo and her family count the bats and send the numbers to scientists who study bats, to see if the bat population can recover. On a summer evening, the family quietly makes their way to the lawn to watch the sky and count the visitors to their farm. This fictional story includes a 4-page For Creative Minds section in the back of the book and a 65-page cross-curricular Teaching Activity Guide online. Bat Count is vetted by experts and designed to encourage parental engagement. Its extensive back matter helps teachers with time-saving lesson ideas, provides extensions for science, math, and social studies units, and uses inquiry-based learning to help build critical thinking skills in young readers. The Spanish translation supports ELL and dual-language programs. The interactive ebook reads aloud in both English and Spanish with word highlighting and audio speed control to promote oral language skills, fluency, pronunciation, text engagement, and reading comprehension. Tap animals and other things that make noise to hear their sounds. Vetters: Thanks to Katie Gillies, Director of the Imperiled Species Program at Bat Conservation International (www.batcon.org), and Catherine J. Hibbard, White-nose Syndrome Communications Leader with the U.S. Fish and Wildlife Service, for verifying the accuracy of the information in this book. The ending has a plethora of facts regarding mega- and micro-bats, echolocation, body parts such as thumbs and tails, how white nose syndrome is spread, protecting them, and resources for counting. 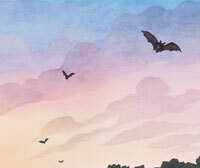 Bat Count is a well-written and nicely illustrated text. 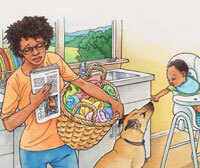 The full-page, color illustrations help breathe life into this narrative of conservation and environmental stewardship. At the end of the text, a section on For Creative Minds provides readers with some general information on bat natural history and white-nose syndrome. An anatomy page (Bat Bodies) allows readers to compare parts of a bat’s body with their own. Bat Count is a delightful tale that actually tells two important, but interrelated stories. On the one hand, this may actually be the first book about white-nose syndrome. As such, it affords young readers (ages 4 - 9/grades K-3) an opportunity to learn about this illness and its effects on bat populations and bat conservation. Since its discovery, white-nose syndrome has been responsible for killing an estimated 6 - 7 million bats in the Northeast. 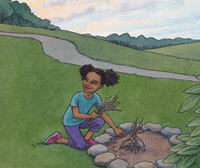 On the other hand, Bat Count also introduces readers to the concept of citizen science. Citizen-science projects are those in which members of the public participate in scientific research. In the biological sciences, it often involves field work―sometimes no farther than one’s own backyard―with observations being reported to principal investigators. Opportunities for citizen science abound, and there is, almost assuredly, something available to pique most anyone’s interest. People of all ages and all walks of life can get involved and make meaningful contributions; however; the involvement of youngsters in such programs serves as a portal for opening young minds to a world of opportunities and possibilities. 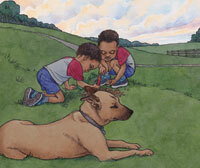 This is a nice book for the budding biologist, naturalist, or conservationist in the family. It offers endless avenues for discussion among parents/teachers and children. Anna Forrester is an amateur naturalist who finds inspiration for her writing in the quirks and curiosities she encounters in the natural world. When she isn’t writing or reading or messing around outdoors, she creates gardens and other green play spaces for city kids. 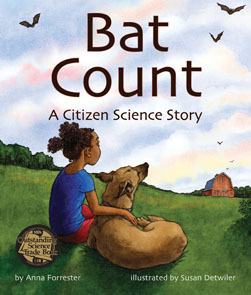 Bat Count: A Citizen Science Story is Anna’s debut picture book, and was inspired by counts she does with family and friends every summer at a farm in Pennsylvania. She loves biking, paddling, and making things—from soups to bug hotels to giant paper snowflakes. Visit Anna’s website at www.annaforrester.com.